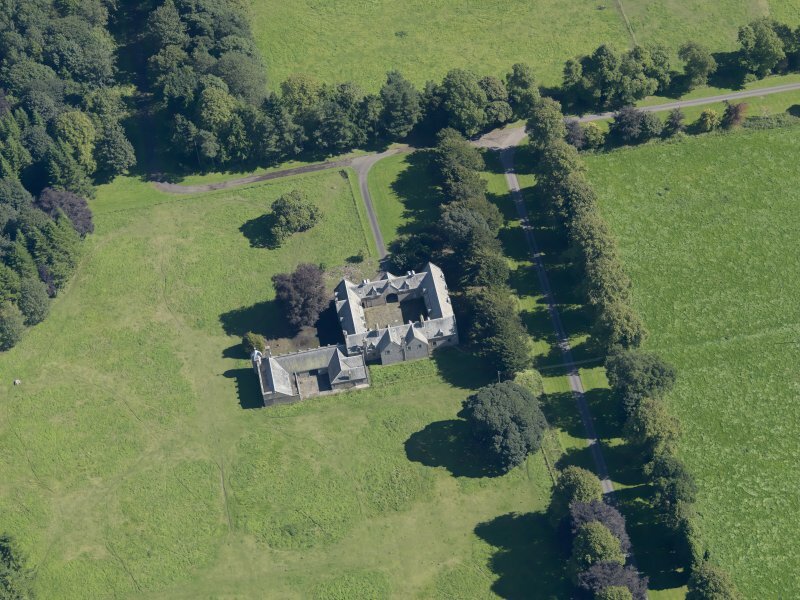 General oblique aerial view of the Panmure Estate, centred on the house, taken from the NW. Interior. 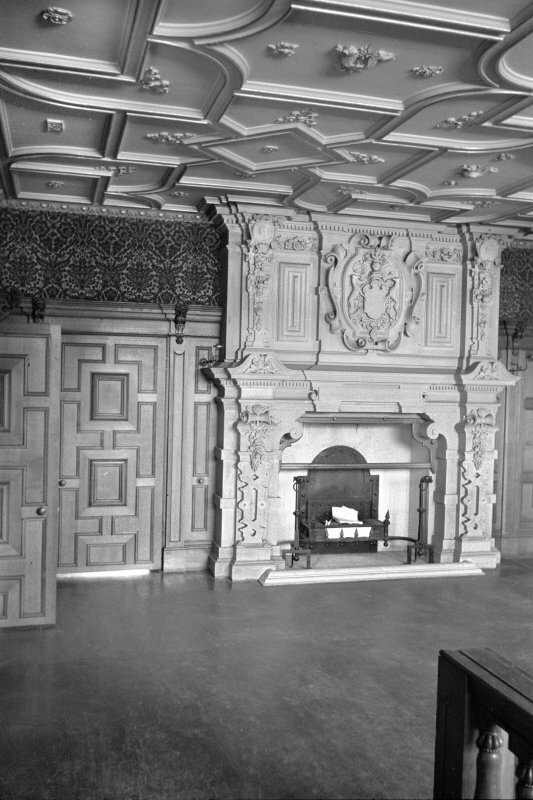 View of front hall and fireplace. Interior. 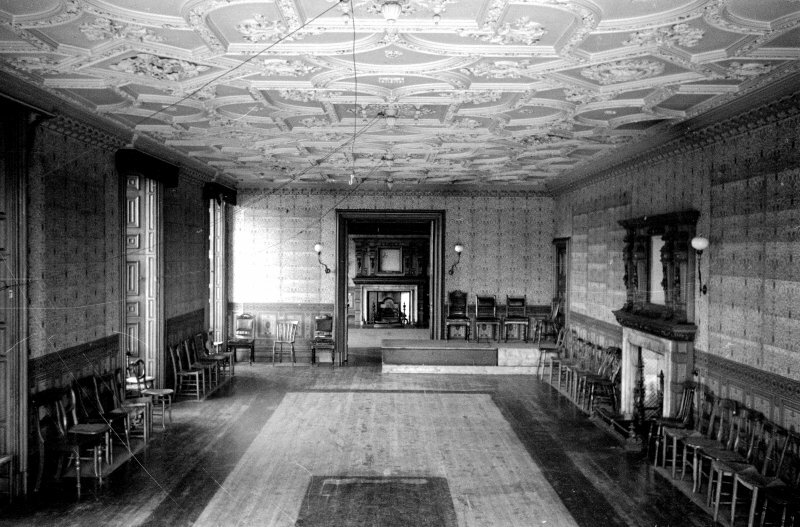 View of drawing room. Interior. 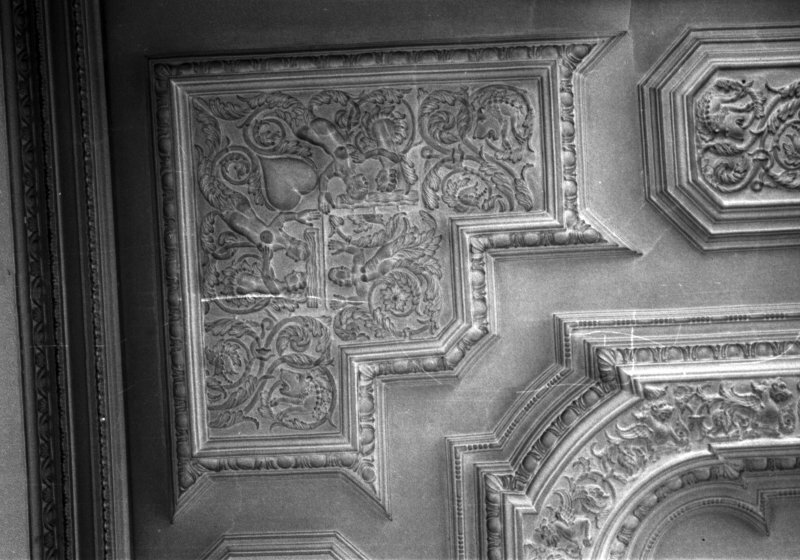 Detail of staircase well ceiling. 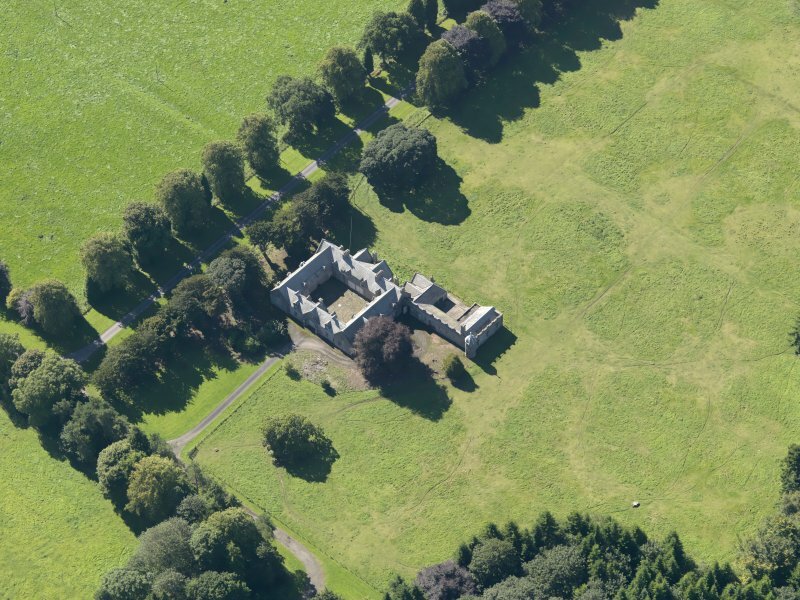 General oblique aerial view of the Panmure Estate, centred on the house, taken from the NE. Interior. 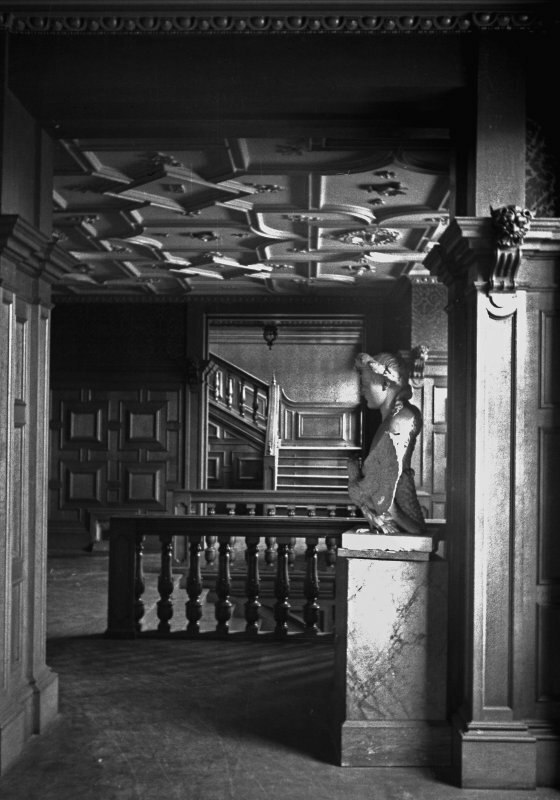 View of staircase well. 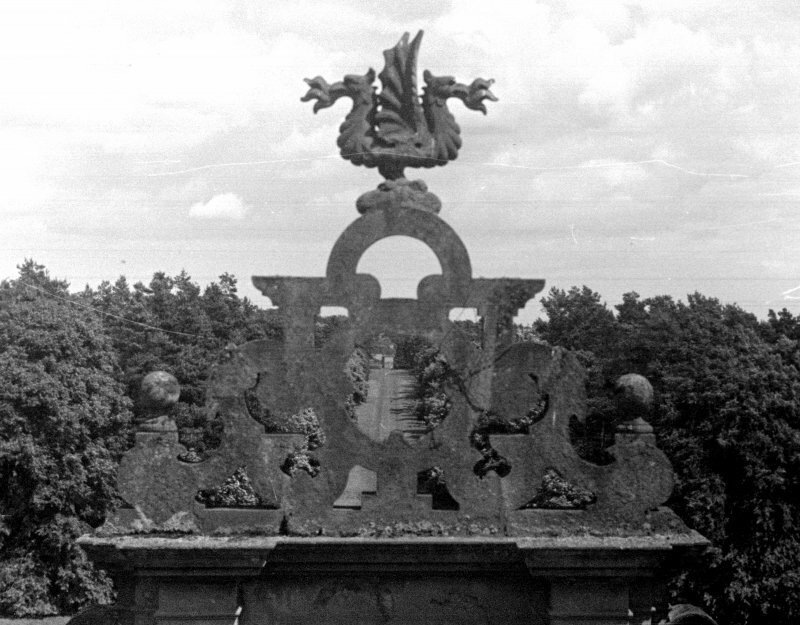 Historic photographic view from E.
Detail of dragons on E front. 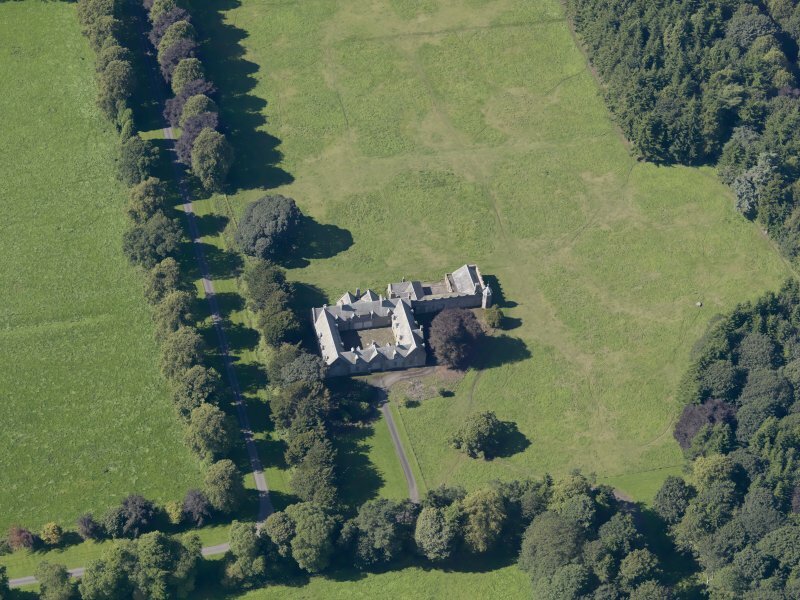 General oblique aerial view of the Panmure Estate, centred on the house, taken from the E.
General oblique aerial view of the Panmure Estate, centred on the house, taken from the SE. 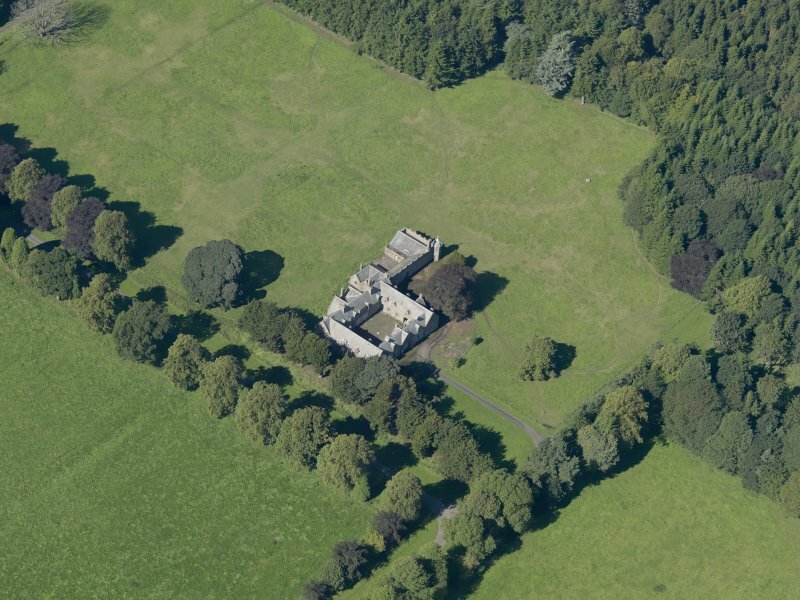 General oblique aerial view of the Panmure Estate, centred on the house, taken from the W.
General oblique aerial view of the Panmure Estate, centred on the West Gate, taken from the E.
Panmure House, which consisted of a central block with lateral extensions flanked by square towers, has been demolished, only a modern stable block remaining. 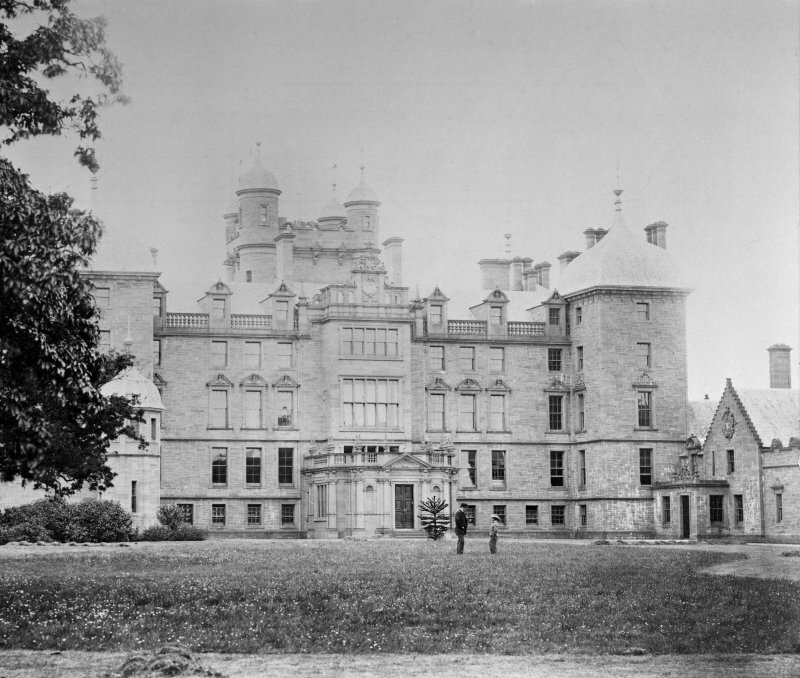 The earliest portion was erected in the late 17th century, but extensive alterations took place about 1860 (A Millar 1890). Panmure House has been demolished. Blown up December 1955. ARCHITECT: David Bryce (Built round house originally by R,Mylne, Snr. and Robert Adam) - demolished. See Architects' File under John Mylne (1666). sold at Sotheby's 19 June, 1982, photocopy of catalogue in NMRS. Building of Panmure House, Volume. Volume in which are noted building expenses. 1. Contract (Master Masons: John Milne and Alexander Nisbet). 2. Names and numbers of Masons (16) and barrowmen in 1666. 3. Sums paid to masons and barrowmen. 4. The sums paid to wrights who made the Lodge and scaffolding. 5. List of various payments. 6. Payments for timber and its carriage. 7. Sums paid to Alexander Nisbet (Master Mason), 26 masons, 3 apprentices, barrowman and quarriers. 8. As above but number of masons now 24. 9. Account for slates from 1668. Complete payment to Alexander Cow for slate work of the body of house 1669 and for the new stables, 1670. 10. Sums paid for nails. 11. Sums paid to wrights. Estimates, contracts, minutes of agreement, reports, discharged accounts, letters and measurements. Tradesmen: Masons: John Milne, King's Master Mason. John Bachop, Tobias Bachop, David Barre, John Barre, John Crow, Alexander Nysbet, Archibald Rule, and James Walker. Estimates for building the stables and coach houses for Panmure House. A comparison of the estimate of ?1, 243.13.8 from Robert Adam and that of ?639.19.10 from John Smart. Estimates for building the front of the stables and the coach houses. Observations n the estimates from Robert Adam and John Smart. Sketches are for a gate, a fireplace, panelling and a Chinese rail. Sketches for chimney pieces (for Panmure?). The sketches are for chimneys in the Palour and in Dressing Room. Slaters: James Horn, Andrew Low, Andrew Smith and Patrick Steven. Building of Outhouses and gates. Discharge by John and David Barre, masons, for payment. Note of conditions agreed between the Earl of Panmure and John Milne, master mason, for the building of the new house. 1. John Milne, the Kings Master Mason. 3 and 4 James Baine, wright. 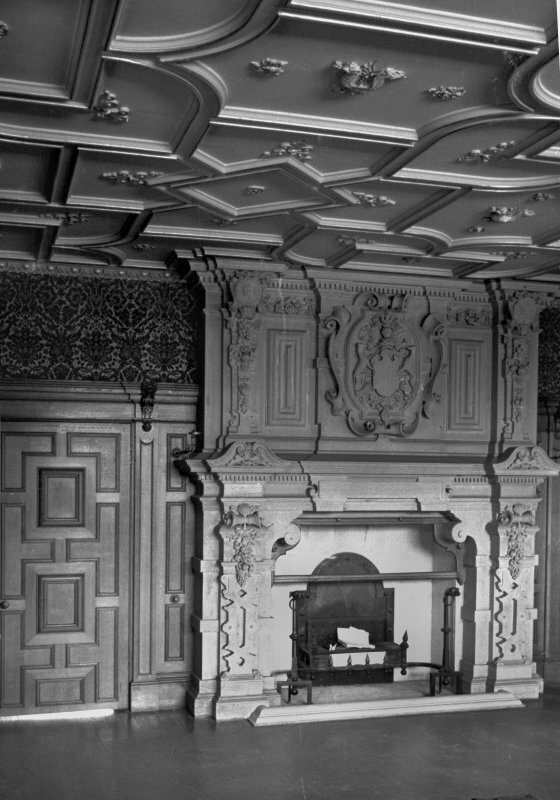 Charles Wilson has fulfilled his contract and in addition he has painted the parlour 'in princes wood' and the arms upon the chimney piece. Account for ?764.13.4 (Scots) and receipt. Minute of agreement with James Walker, mason, for building stables, byres and a washing house. 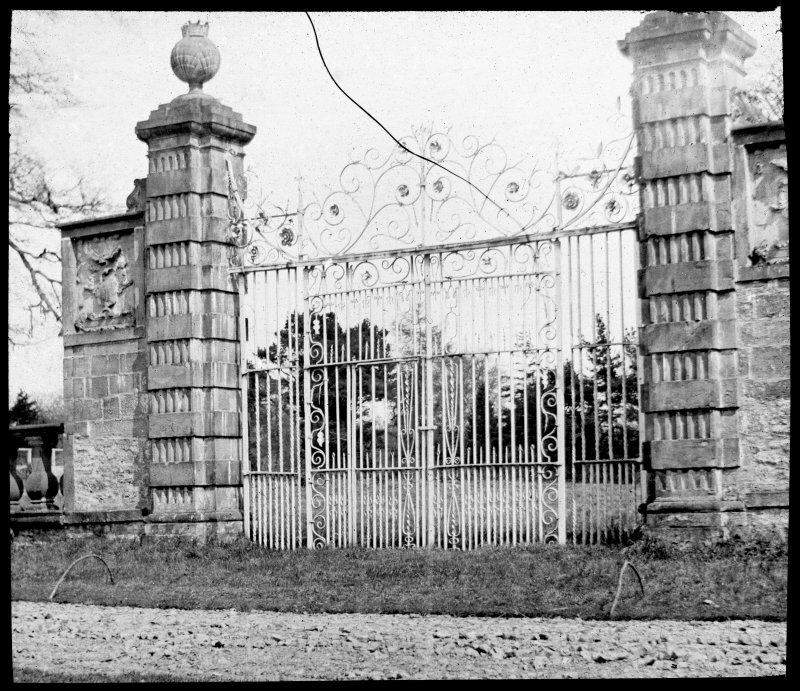 Building of (West) Gate at Panmure House. Agreement with Alexander Nisbet, mason of burgess of Edinburgh for building a gate. 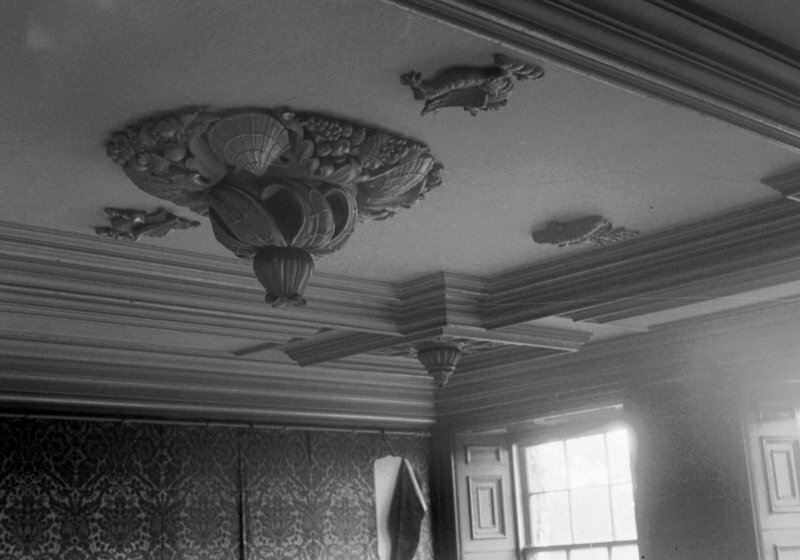 Minute of agreement with James Bane, the King's Master Wright, for plaster and wright work. Alterations and repairs at Panmure House. Masons: Thomas Falconer and William Lyons. Account for Thomas Falconer, mason. 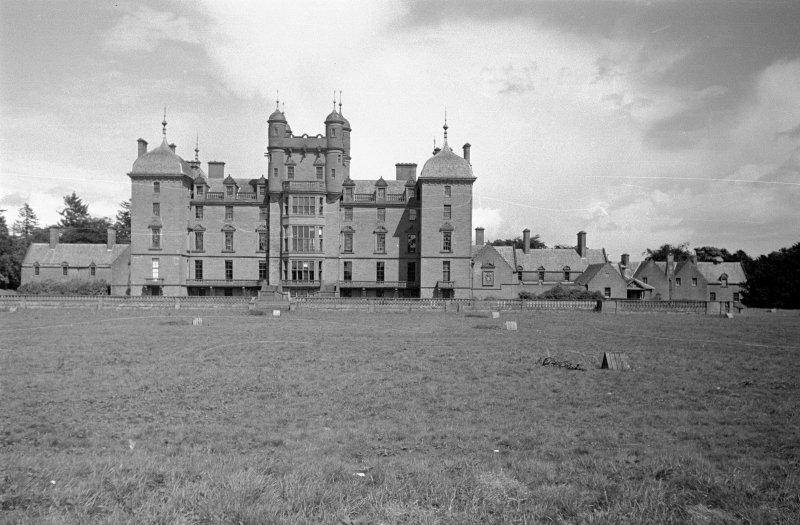 List of buildings on the estate on which William Maule has spent money. It includes churches, manses, schools and farms in Arbirlot, Barry, Brechin, Carmyllie, Dundee, Inverkeillor, Lethnot, Lochlee, Monifieth, Monikie, Panbride and St Vigeans. Accounts (2) from Alexander Nisbet for mason work. They amount to ?2,389 and ?2, 123. Minute and draft of agreement with James Walker, Archibald Ruell and James Craw, masons, with discharge accounts. Account for work at Panmure from Charles Wilson, painter. It amounts to ?324. Scots. Contract between Charles Wilson, painter, and the Earl of Panmure. It concerns painting the windows of the 1st and upper storeys. Note of measurement of glass required for the different storeys of the house. 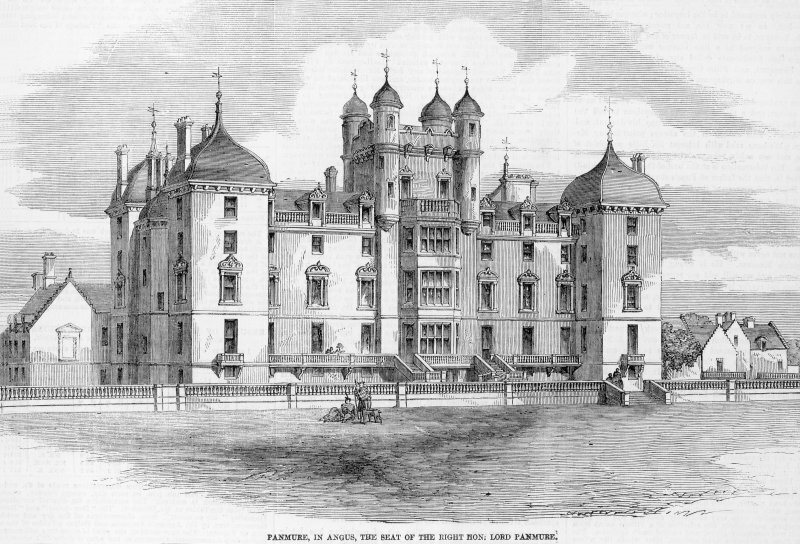 Proposed building of Panmure House. Draft of a letter to a person to be in charge of the building. Some indications are given of the type of plan required. It is to include a basement floor and cellars. Sketch windows of Panmure House. 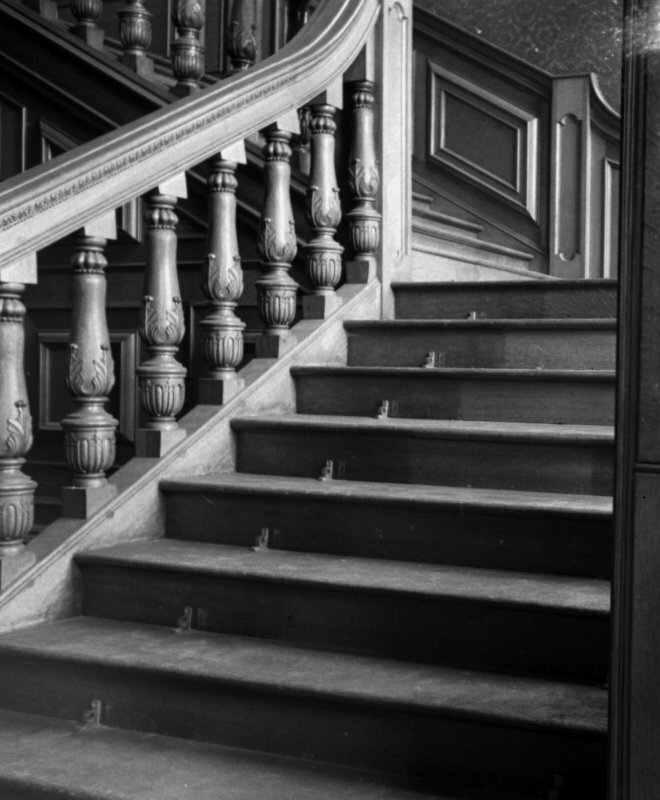 Sketch shows the windows in relation to the stair. Included in papers concerning glazier work. 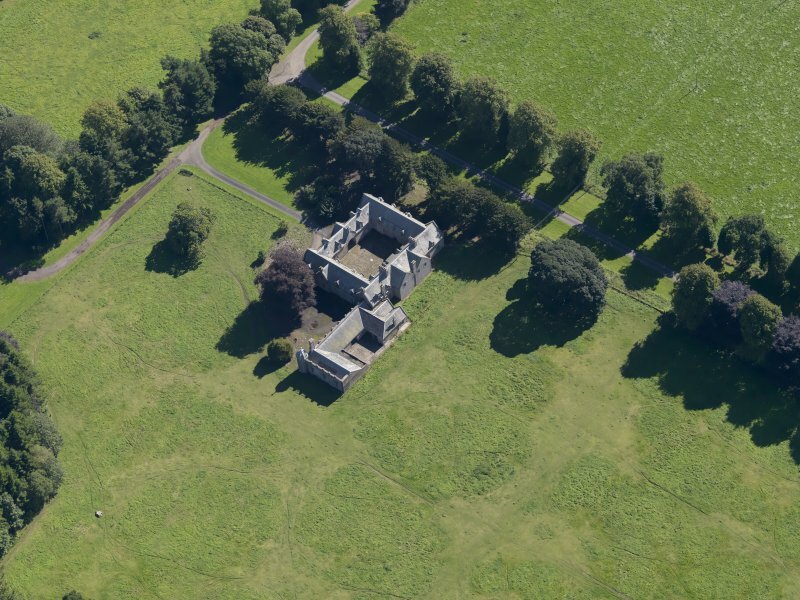 A later note added to an inventory explains that James Maule, grieve at Panmure from c.1748-c.1753, was in charge of the masons when 'the Ruin' was built. Books of discharges by Alexander Nisbet, mason burgess of Edinburgh, partly in the name of John Milne, the King's Master Mason, of payment for mason's work. Supervision of building of Panmure House. Agreement between George, Earl of Panmure, and Alexander Nisbet, mason, for provision and supervision of masons for building of Panmure House. Contract with Alexander Nisbet, mason burgess of Edinburgh, for building the porch, raising the bastions another storey, building stables, and other work. Minute of agreement between the Earl of Panmure and James Baine, wright Burgess of Edinburgh, regarding work to be done at Panmure House. Estimate of wright work (incomplete). 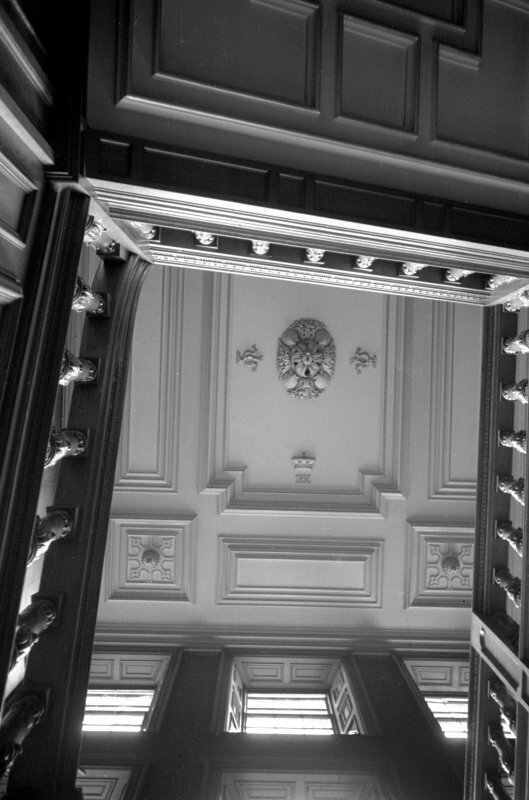 Wright work at Panmure House. Discharged account of John Patersone, wright. It concerns woodwork and plasterwork of drawing room, bedroom, new and old kitchens. Estimate. It concerns woodwork and plaster work in Drawing room, Dining Room and Bedchamber. Elevation and sketch plan for coach houses, stables and dung court. Estimates for work (2). One dated 1753. Ornamental dovecot. (Chinese form on column). 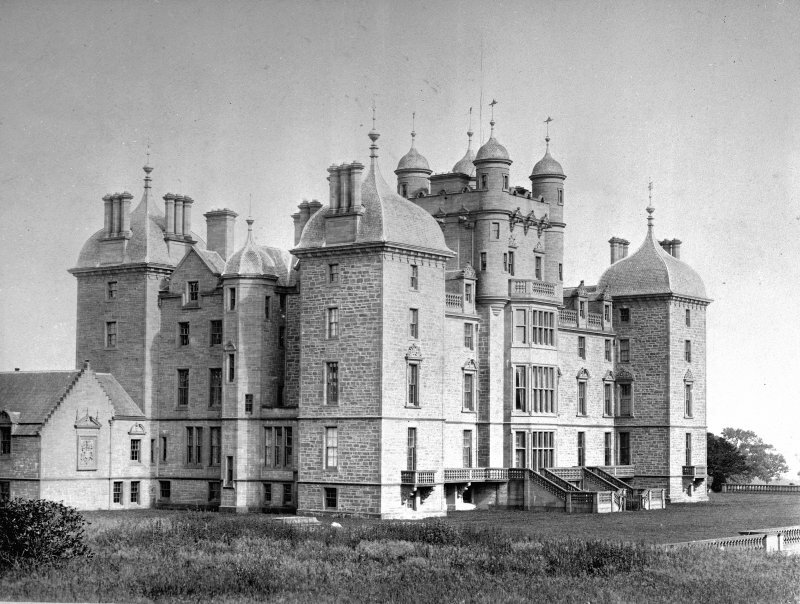 Building stables, coach-house and a new West front at Panmure House. Estimates for designs from Robert Adam at London and John Smart (? Dundee). (A note of estimates follows). Estimate of building stables as designed by (Robert) Adam for Panmure House. It amounts to ?458.9.0. Estimate from John Smart for building the coach houses and stables at the House of Panmure to his own design. 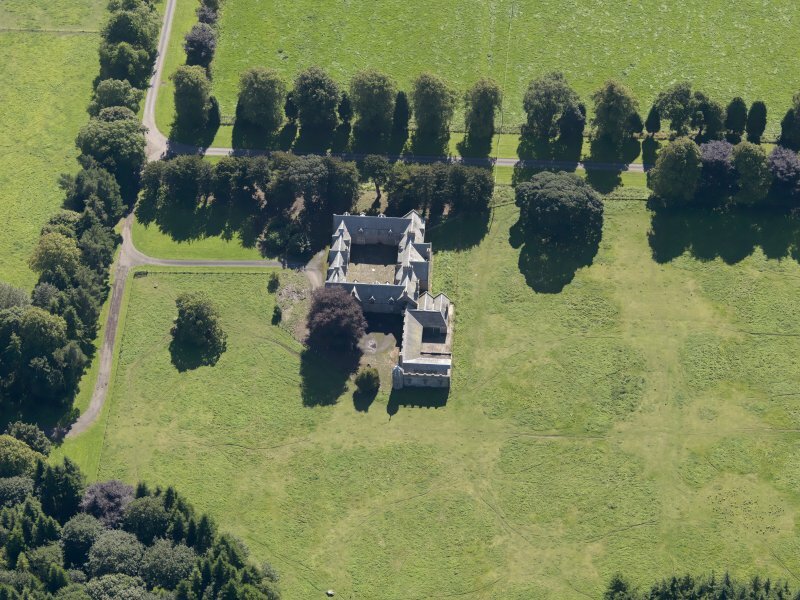 Estimate from John Smart for building the West Front of the House of Panmure to his own plan. Note: On the cover John Adam of Edinburgh named as designer. 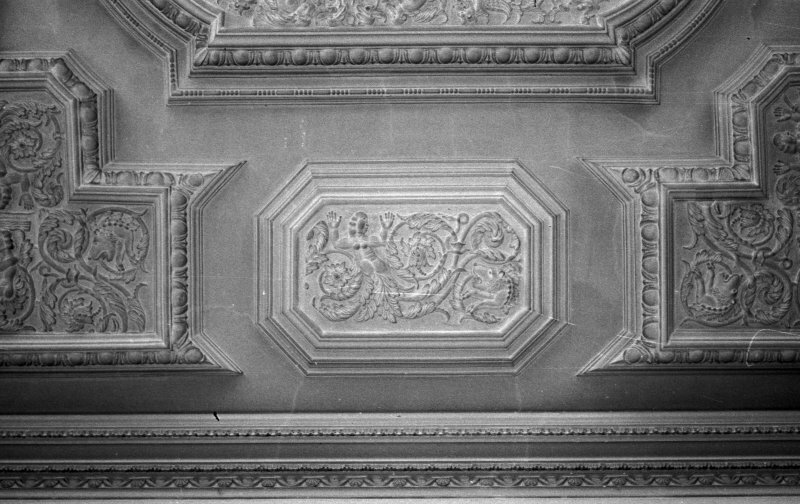 Inside, Robert Adam of London is named. Harrie Maule's inventory of MSS at Panmure (see 1754 below). 14 April - Note by Baron John Maule at end of Harie Maule's 1734 inventory of MSS, showing where charters and papers on Scottish antiquities are now kept, "in a flat oak chest wt Iron bars...in the Library behind the press with the manuscripts"
He adds, 24th Sept. 1766, that they are now in "ye new Mahogony Buroe in ye high drawing room", etc., and that other documents there "were taken out of ye great oak cabinet in ye red room close (t) which contains yet title deed of the Estate"
11th Oct., Memoradum for Baron Maule on Panmure works; (from his factor? - no signature) on Edzell estate. Mr Rose wants to pay Maule his respects and explain situation. Writer has dissauded him as Maule is "thronged with Company". 2236 Aug., Memo on management of Panmure, Southesk, Marischal and Pitcairn, now leased to Sir Arch. Grant of Troup, and to which Baron Maule and Sir James Carnegie now have the right. 2239	Oct., Directions for Panmure, in Maule's hand (similar to Inverary Instructions) - on garden, planting and estate work: e.g. 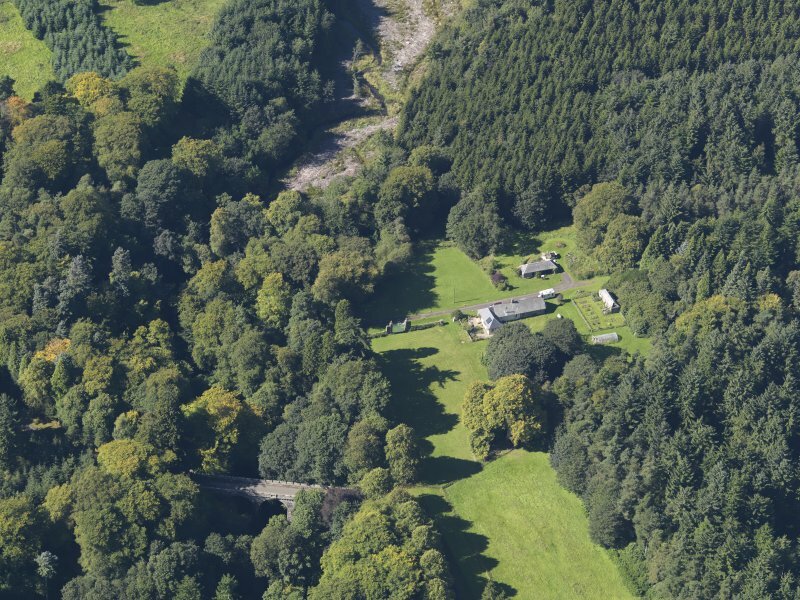 laburnams in East avenue to be felled, and "Powrie is to have some to make a new stair at his house"; various shrubs, e.g tulip trees, platanus, Newfoundland pine etc., to be sent to George Drummond of Blair Drummond, others to Mr McKenzie of Delvin. Cedars. Pave the passage "under ye South Colonade Leading from ye kitchen to ye latter meat room", etc. 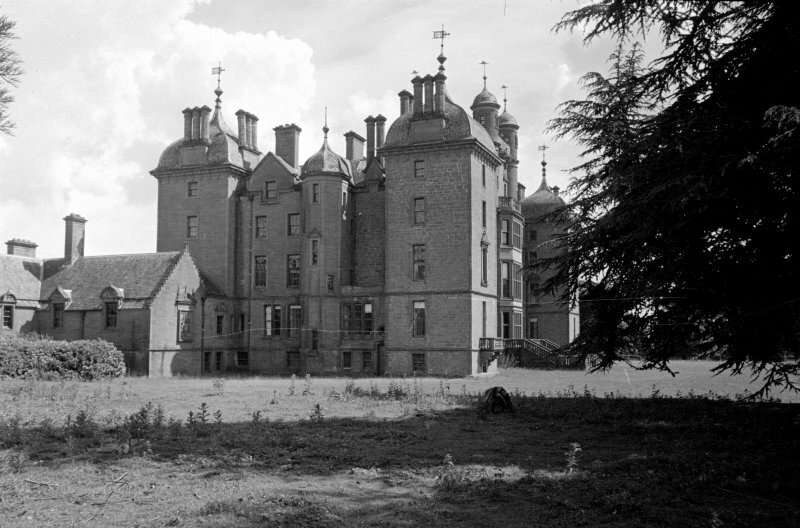 Photographs of the exterior of Panmure House, Angus, by the National Buildings Record Scottish Council c1952-53 prior to demolition. They were taken before the sale of the building. 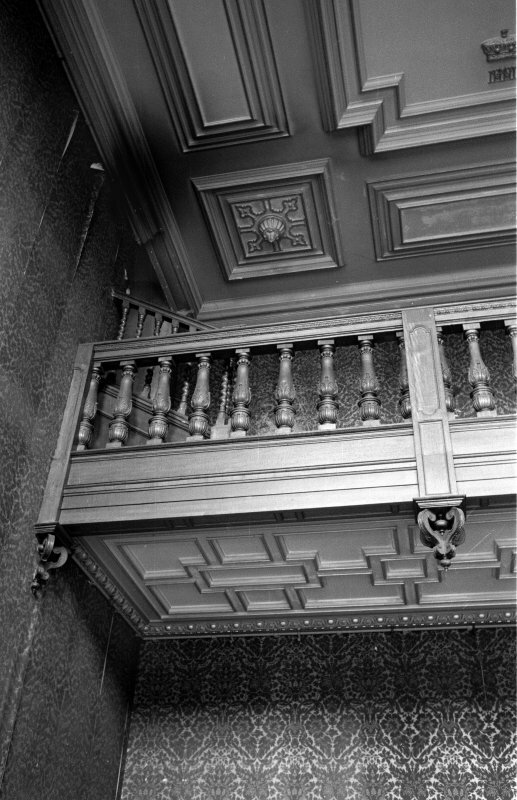 Photographic survey of the exterior and interior of Panmure House, Angus, by the National Buildings Record Scottish Council in 1953 prior to demolition.